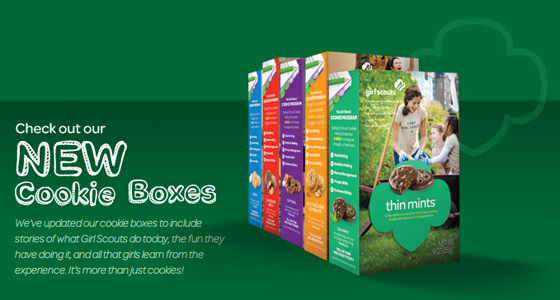 You may notice something a little different about your favorite Girl Scout cookies this year. The new boxes will feature the entrepreneurship and business literacy skills that Girl Scouts --a $790 million business-- aims to teach its members. These include goal setting, decision making, money management, people skills and business ethics, the organization said. The new boxes will feature girls kayaking, working in a park and speaking at scout events, among other activities . The final package design captures moments that show the power of girls working together as they engage in activities like greening a park, volunteering at a soup kitchen, and traveling to Paris. “We have more than 50 million cookie customers across the country, and the cookie box is the most tangible and powerful way for us to communicate directly with consumers,” said Anna Maria Chávez, CEO of Girl Scouts of the USA. Girl Scouts of the USA, which celebrated its 100th birthday in March 2012, has 3.2 million members. Girl Scout cookie season typically runs from October to May. If you can’t track down a Girl Scout, you can always use the free Cookie Finder app for your iPhone or Android.